Carding is a pre-spinning treatment to align the fibers which enables you to spin fibers more easily. For the technique of felting or making woolen blankets, carding is essential. You have to use handcards the two. Louët handcards are made of tulip wood, a Dutch Poplar variety. These light weighted handcards have a curved back and ergonomic handles that fit comfortably in your hands. The 19 x 10 cm (7 1/2” x 4”) handcards are available in fine (46 teeth per inch) and extra fine cloth (cotton carders, 110 teeth per inch). In order to ensure a long life, the teeth on all Louët carders are made of high grade plated steel wire. 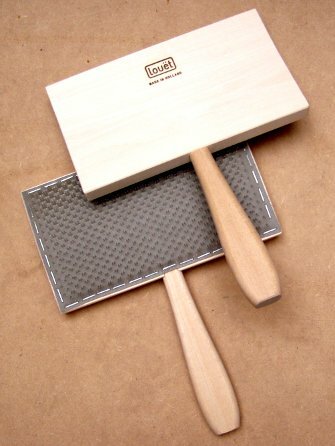 Louët has five different drumcarders: the Standard, Junior, XL, the electric drumcarder Standard and the electric drumcarder XL. They are made of laminated birch and have a hard white coating. The drums of the carders are 19 cm (7 1/2”) wide, the drum of the Junior is 10 cm (4”) and the XL is 30 cm (12”) wide. In order to ensure a long life, the teeth on all Louët carders are made of high grade plated steel wire. All gearboxes, except for the Elite drumcarder, are enclosed to prevent fibers entering the gear system. 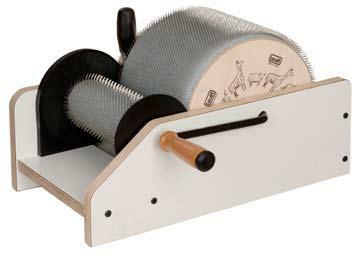 The drumcarders can have a fine cloth of 46 teeth per square inch, so you can easily card wool and other coarse fibers. Or you can choose for extra fine cloth (72 teeth per square inch). The advantage of this extra fine cloth is that you also can perfectly card very fine fibers. For drumcarders it is common to mention the gear ratio that drives the licker-in when you rotate the large drum. However, what really counts for carding is the ratio of the surface speed of both drums. This surface speed ratio is 9:1 for the Electric drumcarder and 12:1 for the 72 teeth per square inch. The drumcarders come with a doffer brush, a doffer pin and two table clamps, attaching them to the corner of a table. 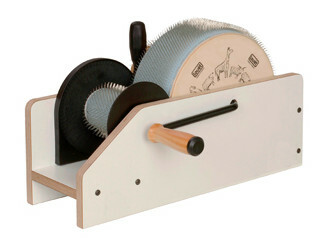 The Standard drumcarder weighs 7 kg, the Junior 5 kg. 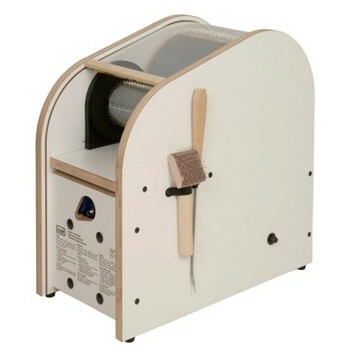 The Electric drumcarder is available with a 115 V or a 230 V motor. The motor drives the large drum with V-belt system, coupled to the enclosed gear system, at approximately 90 r.p.m. The motor has a thermal safety and the drums are covered with a transparent plastic protection cover for extra safety while carding. The electric carder stands on buffers and because of its weight of approximately 21 kg (46 lb), it doesn’t need to be clamped to a table.